Two weeks ago, I was fortunate enough to take time to visit with my most dear friends from Clemson. Beth and I met while working in the on-campus restaurant Seasons by the Lake. We bonded over a pitcher of Killian’s one night after working a shift together. The rest, as they say, is history! I was honored to be asked to serve as Beth’s maid of honor when she wed Jason in Charleston, SC. 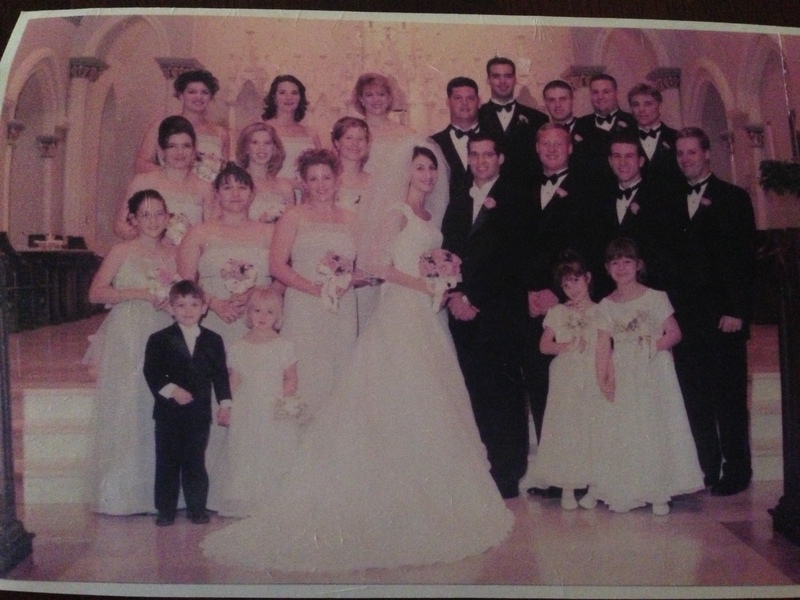 Beth and Jason have been together since they were sixteen! Therefore, Jason was a part of the package for me (and a fantastic part! ), as I was for him. They are two extraordinarily lovely people, and they continue to be one of the strongest couples I know. They lived in Manhattan after college for ~12 years before moving to a gorgeous home in Sparta, NJ. That’s where I went to spend a week visiting with them. Looking back, my most vivid memory from their wedding was of me constantly chasing them around and shoving a bite of food into their mouths at each brief opportunity between the obligatory conversations with every guest who participated in the celebration! It was my duty to help them enjoy everyone’s company, but also to ensure they enjoyed the food! Beth was beautiful, as always. And, Jason, is a good-looking man – whether dressed up or casual. And, I forgot how good-looking my boyfriend at the time was (back right). He’s happily married and I will always wish him and his family the best! Last week was a bit more of the same – keep Beth focused on doing what she needed to do (rest), and help life continue as normally as possible for her and Jason. 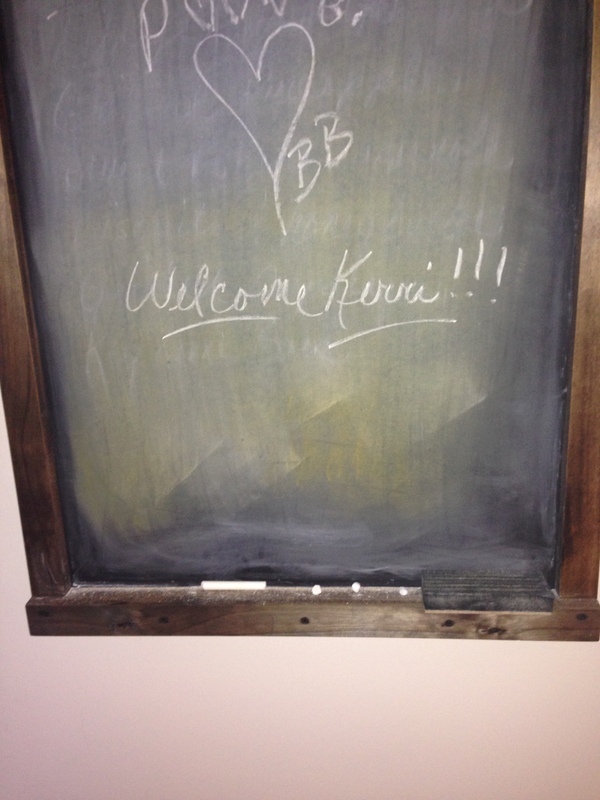 As always, Beth and Jason were gracious and welcoming hosts. Beth had surgery a few days before I arrived, and she was ordered to take things easy, rest, and not exert herself. That’s where Jason and I came in. We took over the household duties – including cleaning, shopping, cooking, etc. Now, Beth and Jason are both accomplished cooks, so preparing meals for them was a bit daunting! 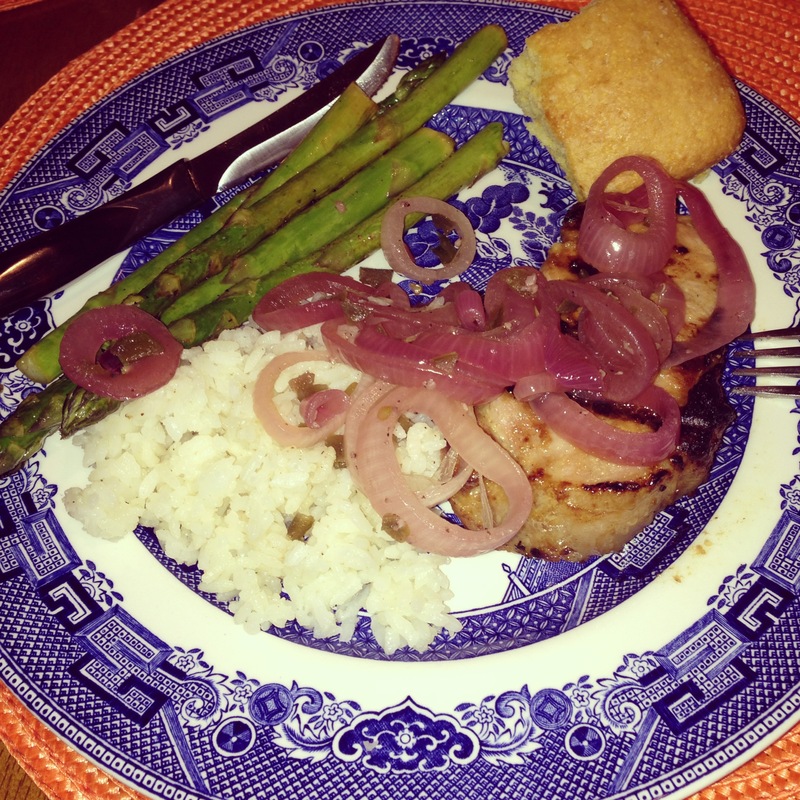 However, I knew that I had the old adage going for me…food tastes best when someone else cooks! Some of my friends will recognize these recipes, and I promise it’s not that I have such a limited repertoire! It’s really that a few of the meals I prepared have been “crowd pleasers” in the past. People often ask me for the recipes. So…I thought I’d take a slightly different tact on this post and share the recipes of some of the food I cooked while visiting with Beth and Jason. On Monday, when I arrived, Jason prepared grilled chicken for us. 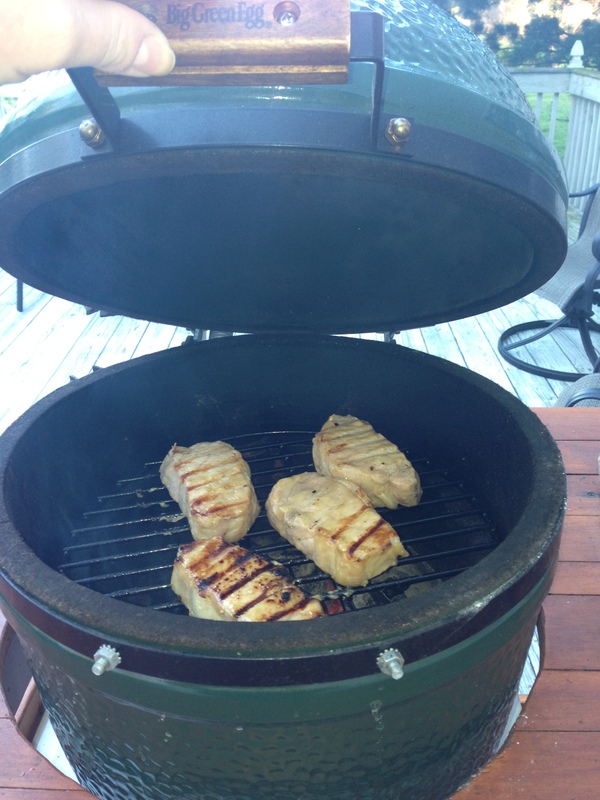 He introduced me to his Big Green Egg (my friend Bryan also uses the BGE to make masterful creations! ), which I ended up using later in the week as well. Breakfasts and lunches were fairly easy and nondescript, so I’ll focus on what we had for dinners. Although, I would be remiss not to mention the Banana Bread recipe (please note that this does not take 2 hours to prepare – maybe 20 minutes!) and the Cinnamon Roll Coffee Cake recipe. Stir together 3/4 c brown sugar, cream, and salt for caramel topping. Pour caramel into prepared pan and spread to cover pan. Sprinkle pecans over caramel. Process ingredients for streusel in food processor until sandy, w/ no clumps. Set aside. Whisk together dry ingredients for cake and set aside. Whisk together buttermilk, yogurt and eggs in a measuring cup (w/ pour spout) and set aside. Using a mixer, cream together softened stick of butter and sugar until combined. Alternately add flour mixture and buttermilk mixture, starting and ending with the flour mixture. Blend only enough to incorporate the dry ingredients into the batter. Spread half of the batter over the caramel in the cake pan. Then, sprinkle with half the streusel. Repeat one more time with remaining batter and streusel. Bake coffee cake until the center comes out clean – 50-60 min. Cool on rack for 5 min, then loosen and invert onto serving plate (while hot). Slightly cool before serving. On Tuesday, I threw together one of my favorite snacks. It’s a recipe I saw on “Jamie Oliver’s Food Revolution”, and have made several times since. It’s an easy dish to bring to a summer party. 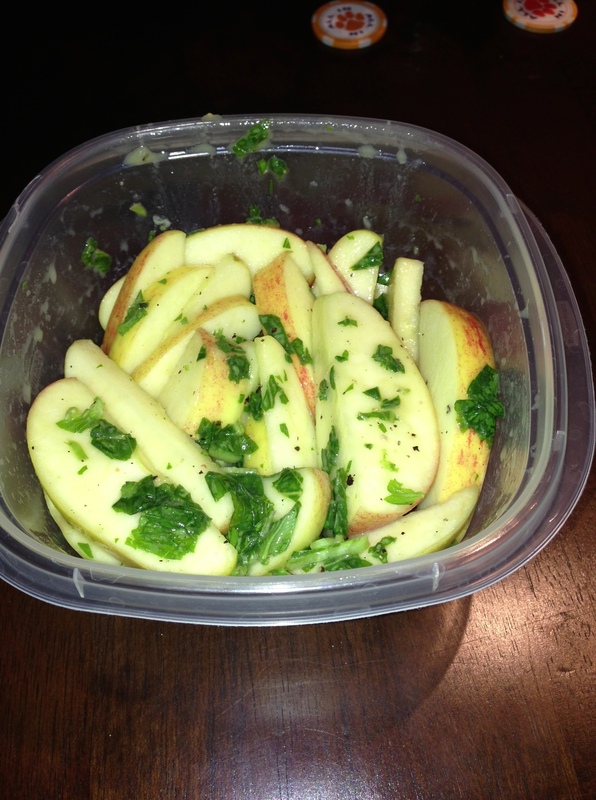 Y’all need to try this simple snack recipe – it’s so YUMMY! Mix lemon juice and Dijon until emulsified. I usually use 3-4 Tbs lemon juice and ~2-3 Tbs of Dijon, but I doctor it until the taste is a nice blend of the two. Add apple slices to liquid. Add salt and pepper (I usually just do a quickly once around with the grinders). Toss apples and continue to doctor the flavors to taste. Add basil and toss again. Serve immediately. Keep in a Tupperware container for munching later in the week. 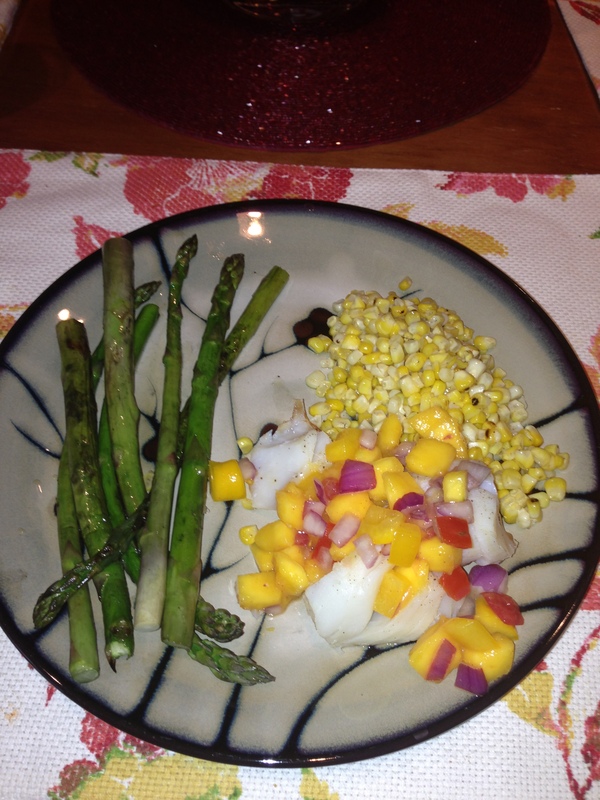 That evening, I made grilled Cod with mango salsa, grilled asparagus and grilled lime-pepper corn (a recipe from some friends from Corning, Inc.). I actually made this meal again this week for my family and friend so I could get a picture. The cod is simply marinated in lemon juice with salt and pepper. I let it sit out at room temperature for 3o minutes prior to grilling for ~10 minutes (until flaky). Grilled corn before being sautéed. 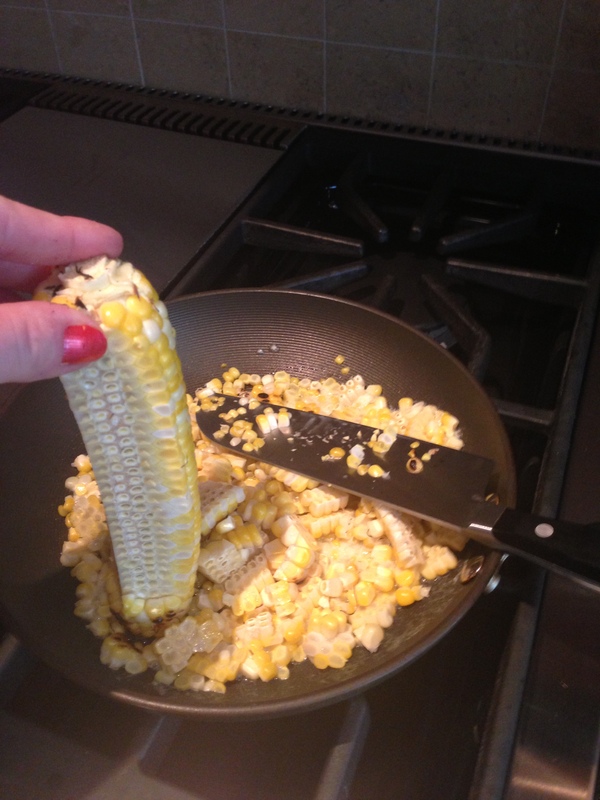 The corn is set directly on the grill (no husks) to give it a slight char and then I take it inside to slice the kernels off into a saucepan with a couple of pats of butter. I then add a tablespoon (or so) of lime juice, salt, black pepper, and cayenne pepper to taste. And, the asparagus was drizzled with olive oil, and salt and pepper, and then grilled for 3-4 minutes. On Wednesday, Beth marinated the leftover (uncooked) Cod, and baked it in parchment paper. We had leftover salsa to add to it. We also had the apples and green beans. 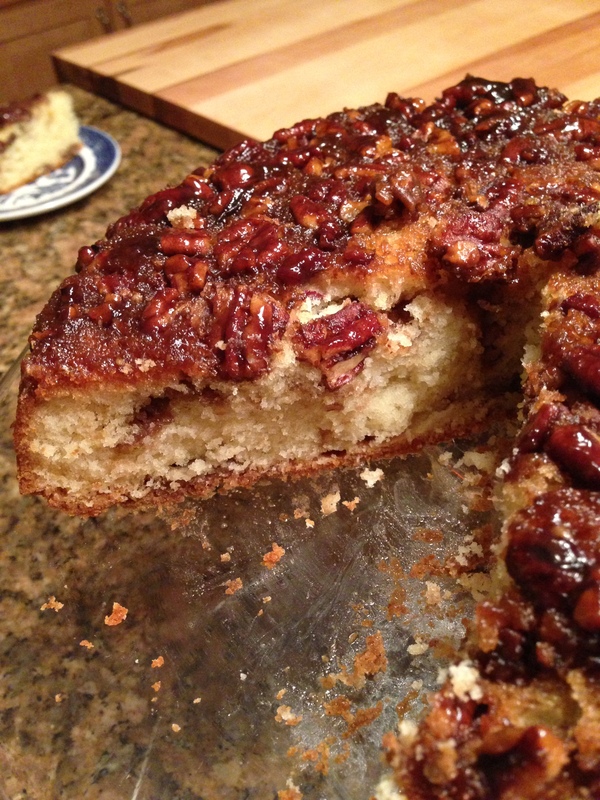 It was an easy meal – but it was also after I made the banana bread and the coffee cake, so the break was a welcome one! Thursday, I ran to Kroger (I had secured “my parking spot” at this point – lots of runs to the grocery store!) to pick up some Sockeye Salmon. Beth was going to brine it and Jason would cook it on a honey coated Cedar plank. For dinner that evening, I made a variation of a recipe my friends and family always love. Usually, I make it with a full pork tenderloin, but this time I used the pork chops Beth and Jason had on hand. We also grilled up some leftover cornbread that Beth had made Monday. Process first eight ingredients in food processor or blender. Place pork in large Zip Loc bag and pour marinade over pork. Marinate in fridge for a day or longer, turning occasionally. Let pork stand at room temp for 30 min before grilling. Drain marinade. Place pork on oiled grill and cook 5 min per side (20 min total). Let stand on cutting board 5 min before slicing. Serve with onion marmalade. Saute onions in the oil in a large skillet over medium heat until softened. Season w/ salt and pepper. Add the chiles and saute for a minute. Add honey and cook for a minute. Add the vinegar and simmer until almost all of the liquid had evaporated, stirring constantly. Add the water and simmer ~10 minutes or until slightly thickened, stirring constantly. This can be prepared ahead of time – the longer it sits, the spicier it gets! If refrigerated, reheat prior to serving with the pork. Here is the proof that I used the Big Green Egg! Pork chops on the grill. On Friday, Beth asked if I would make another loaf of banana bread so they could freeze it for later. I gladly obliged. 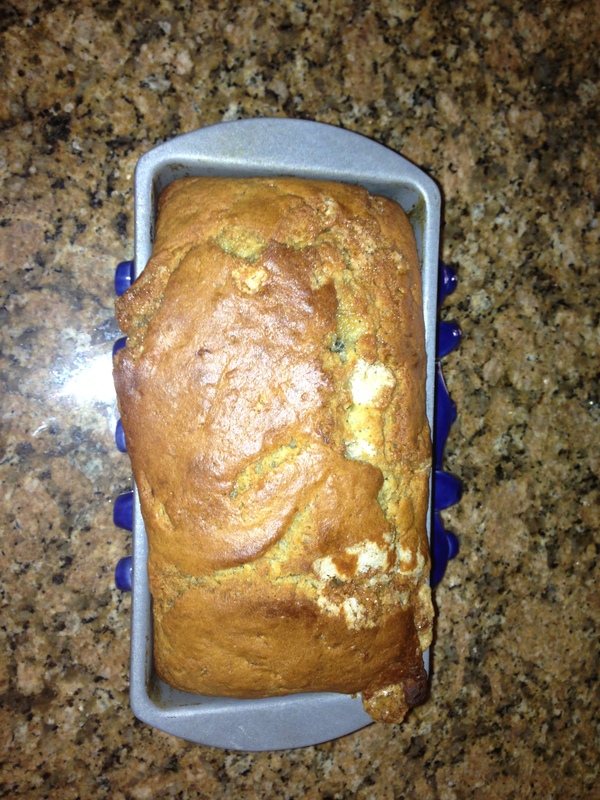 And, friends…I’m serious that the recipe I linked to above is a really good basic banana bread recipe. Yum! As mentioned previously, we were set to have salmon for dinner. Salmon is generally my least favorite fish, but this tasted more like a steak than fish. It was not the slightest bit “fishy”! Very tasty. Beth’s brine consisted of water, coarse sea salt, soy sauce and brown sugar. She placed the skinned salmon in a TupperWare container. She covered the fish with ice and added the brine. The fish was refrigerated overnight (1 hour would be the minimum recommendation). Then, the fish was placed on a soaked Cedar plank, coated with honey. 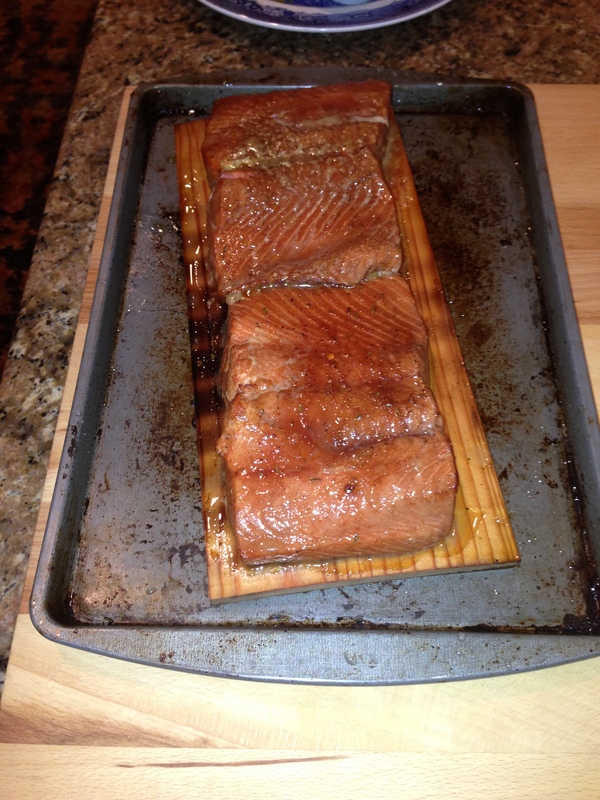 Brined Salmon on a Cedar plank. Jason grilled it up, using some additional smoking chips as well. Since Beth was feeling a little bit better, she decided to make a side dish of Quinoa and Grits. It was a delicious side, flavored with Pepper Jack cheese , giving it a slightly spicy kick to it. 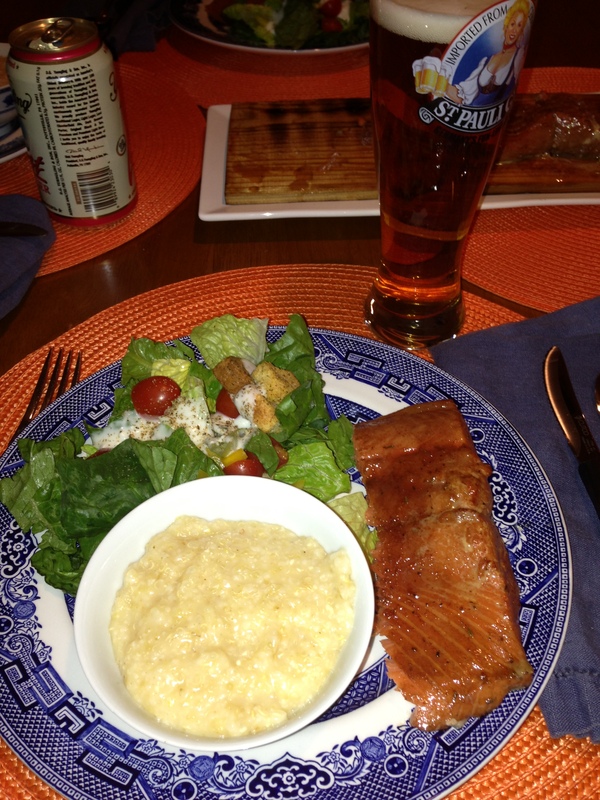 Salmon, salad, and cheesy quinoa/grits. All in all, we had a wonderful, relaxing week together. I got some severely overdue QT with my dear friend. I also got to meet their new “kid”, Buddy. He has a very different personality than their beloved Toes Kitty, but I think I ultimately won him over! Buddy. 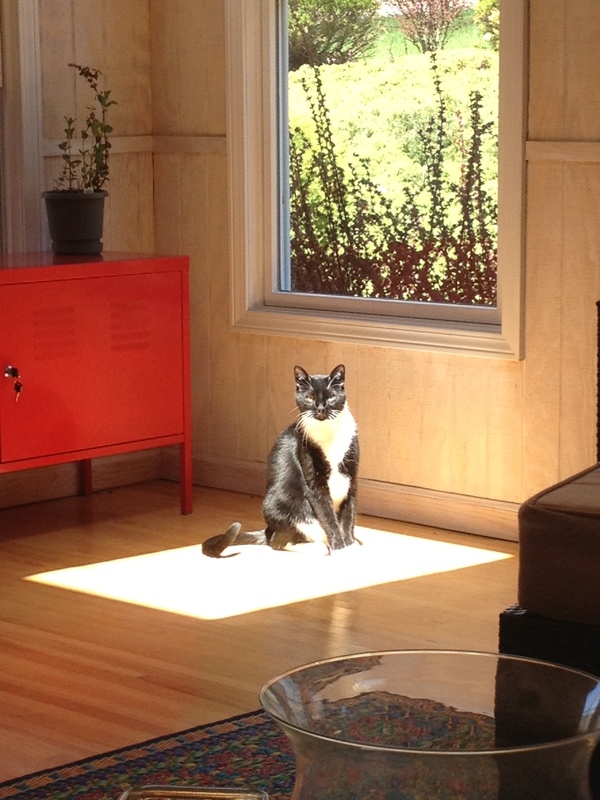 He’s a beautiful cat. We should all be lucky enough to spend a week with our best friends! 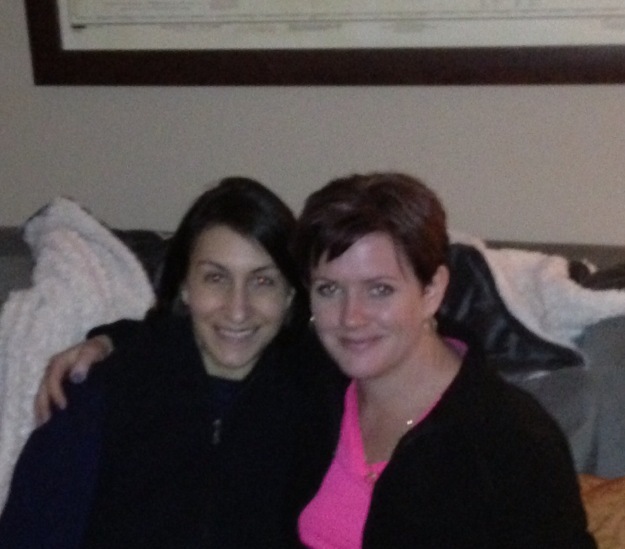 I’m so fortunate that I was able to jet over to NJ for a while and see Beth, Jason and Buddy! And, readers… If you happen to try any of these dishes, please leave a comment. I’d love to hear what you think about the meals.